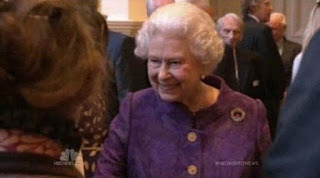 The Queen and the Duke of Edinburgh held a reception to celebrate the tenth anniversary of the Queen's Award for Voluntary Service at St. James' Palace. 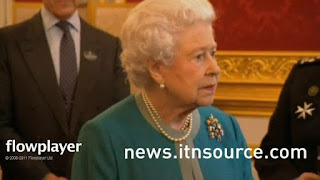 Click for video from ITNSource ("The Queen and the Duke Meet Volunteers"). No kidding, this brooch really is at the top of the pile at the moment! Unusual to pair rubies with this color outfit for her, but the rubies are small. Later, the Queen and the Duke of Edinburgh attended a reception at the Royal Geographical Society to mark the 60th anniversary of the first successful climb to the top of Mount Everest by Edmund Hillary and Tenzing Norgay. Click for video from NBC News. And classic purple for her Everest reception later on. Of course, news of the ascent reached Britain on June 2, 1953, the day of the Queen's coronation, linking the two events in history. In other news, a striking new photograph of the Queen, in her robes of the Order of the Thistle and the Grand Duchess Vladimir Tiara with emeralds has emerged. Click here to see, and for more information. This is rare - it has been several years since the Queen took the emeralds out for a spin. And even more unusual to see her standing out in the hills all dressed up, but I like it. Fabulous contrast.